Prescription drug ads are a multibillion-dollar industry that promotes treatments you may or may not need. Here's how to use that information to your advantage. Ads for prescription drugs are everywhere. You can't watch a sporting event without seeing an ad touting a treatment for erectile dysfunction, high cholesterol, high blood pressure, or joint pain. Drug marketing is a big business, and companies are willing to spend a lot of money to offer you an easy solution to a health problem you may or may not have. 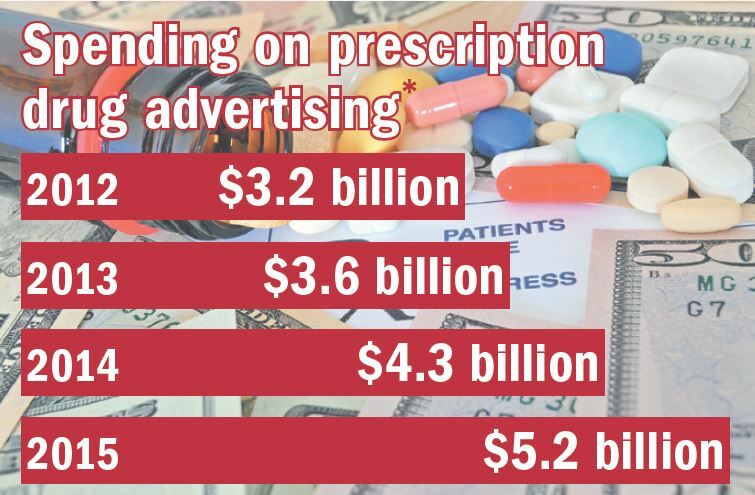 From 2012 to 2015, yearly spending on prescription drug advertising in all media outlets (except digital) rose from $3.2 billion to $5.2 billion, and that figure is expected to only go up. "Older men are a prime target for prescription drug advertisements since they are prone to multiple chronic health conditions, but they should approach them critically as a resource for information and not as answers to questions about treatment," says Dr. Ameet Sarpatwari, an instructor in medicine at Harvard Medical School who studies pharmaceutical marketing. The United States and New Zealand are the only countries where drug makers are allowed to market prescription drugs directly to consumers. The U.S. consumer drug advertising boom on television began in 1997, when the FDA relaxed its guidelines relating to broadcast media. A reminder ad gives the drug's name, but not the drug's use. The assumption is that the audience already knows what the drug is for. This kind of ad does not contain risk information because it does not discuss the condition the drug treats or how well it works. The FDA does not approve prescription drug ads in advance, but its staff tries to monitor them to ensure claims are not false or misleading. Ads are submitted to the FDA only when they first appear in public, which means people may see inaccurate ads before the FDA has had time to review them and seek corrections. Many medical advocacy groups say that drug companies employ direct-to-consumer advertising in a way that puts consumers at a disadvantage. First, the FDA cannot limit the amount of money companies spend on advertising; nor can it ban ads for drugs that have serious risks. Companies don't have to spell out exactly how the drug works, mention the cost, or note if there is a generic drug in the same class or a similar drug with fewer risks. The ad blitz of expensive brand-name drugs is often cited as a factor for rising health care costs. Prescription drugs accounted for nearly 17% of total health care spending in 2015, up from about 7% in the 1990s before the revised FDA guidelines went into effect. "These increased costs translate into higher insurance premiums, coinsurance rates, and copays," says Dr. Sarpatwari. "Seniors have been particularly hard hit, facing high out-of-pocket costs for select so-called specialty medications—high-cost, sometimes heavily advertised products—under Medicare Part D."
And the drug ad landscape may change even more. Dr. Sarpatwari says that soon drug companies might be able to advertise drug uses that haven't been vetted by the FDA, called off-label uses. While some off-label uses for drugs are well-studied and have been a part of routine medical practice for years, many other off-label uses have not. For example, an antidepressant may one day be advertised as a treatment for insomnia on the basis of highly limited data that may not have passed FDA review. The most important issue that consumers need to realize with drug ads is that they are just that—advertisements. Their primary goal is not to help the consumer, but to sell the product. "The information is designed to tell you what it is for and why you need it—but not if you need it," says Dr. Sarpatwari. But drug advertising is not all about deception. It can offer helpful information if you know what to look for. "Advertisements can offer information on drugs that may help many older men, especially those who have conditions that may be tough to treat or manage, such as diabetes and hypertension," says Dr. Sarpatwari. "Ads can help men learn what's available and spur them to strike up a conversation with their doctor. Such engagement can definitely be a good thing." If you're curious about a drug, make sure to ask your doctor the right questions during your next visit (see "Drug ad questions"). Even if the drug is something your doctor agrees you should try, always ask if there are alternatives or lower-cost generics available. Another benefit: your conversation may lead to a discussion about other, nondrug treatments for your condition that may be even better and cheaper. What condition does this drug treat? Why do I think that I might have this condition? If I have the condition, am I part of the population the drug is approved to treat? Should I take this drug if I have another condition as well? Should I take this drug if I am taking other drugs? Which of the drug's possible side effects should I be concerned about? Are there other drugs or a less costly drug that treat my condition? Do other drugs for my condition have different side effects? How can I learn more about this condition and this drug? How much weight loss is cause for concern?